Another week, another good cause for us to help. 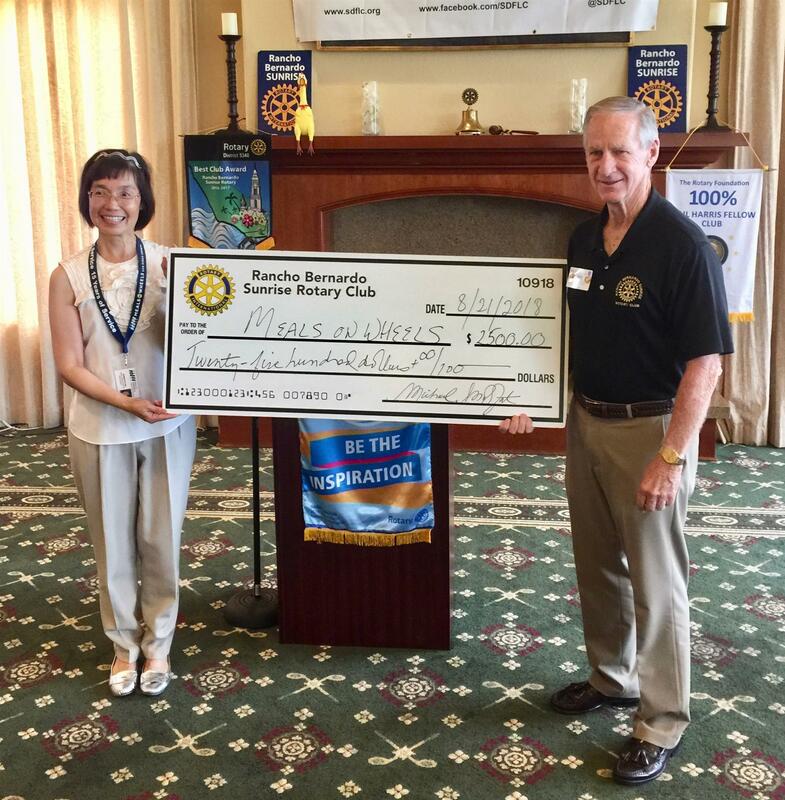 That's just the way life is at the Rancho Bernardo Sunrise Rotary, where we are always on the watch for groups and individuals within the community who can benefit from our time and our treasure. This morning we met with Charlotte Fan, who runs the North County San Diego Service Center for Meals on Wheels. She walked us through the thousands of San Diegans who volunteer huge blocks of their lives to making sure seniors who wish to live independently can do just that! With Charlotte's help we left with a much better understanding of the meals and other services that are made available to seniors, the team-building opportunities this can create for groups and businesses, and the help they're looking for at every level throughout their organization. Not to be left out of the fun, club president Mike Moffatt then gave Charlotte a check for $2,500, which should be enough to feed around 700 people tomorrow. You, too, can get involved with Meals on Wheels by calling Charlotte at 760-736-9900. Or visit them online at www.meals-on-wheels.org to learn more.